Preheat oven to 450 degrees. When the oven is hot, place a 9- or 10-inch cast-iron skillet in the oven to heat. In a large bowl, combine the cornmeal, flour, and sugar, and stir with a fork or a whisk to blend. Add the eggs and buttermilk. Stir until mixture is just combined; do not overblend. Melt the butter in the hot skillet. Swirl the butter around to grease the sides and bottom of the skillet, and then pour the excess butter into the cornmeal batter. Stir until just blended. 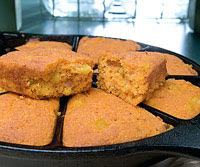 Pour the batter into the hot skillet and bake for 20 to 25 minutes or until cornbread is golden brown and begins to pull away from the sides of the pan. This entry was posted on 5:02 PM and is filed under Easy Snacks . You can follow any responses to this entry through the RSS 2.0 feed. You can leave a response, or trackback from your own site.